Why is working on the move so hard? The promise of enterprise mobility is an attractive one for many businesses. Travelling tends to amount to wasted time. Despite promises of working on trains, planes and automobiles, there are typically delayed flights, lengthy hotel check-ins, and the unavoidable hanging-around that makes business travel unavoidably inefficient. The technology that meant the office comes with us in a laptop bag, or even our pocket, came with a promise that we could work from anywhere. But the mobile devices that workforces are equipped with are in fact often seen as corporate ticking timebombs: they're purportedly insecure, or expensive to maintain, and they're outdated as soon as you've bought them. But the other lesser-known pitfall is that as soon as these devices are taken abroad, they can rack up inordinate data costs, even when apparently inactive. If you've ever switched off your phone when you arrive in a new country, you understand the issue. When employees travel abroad and use data roaming services, the costs they incur are often far higher than any mobile phone contract budget. But the main problem is that the degree by which they are higher is impossible to predict. Costs can spiral out of control with little or no warning – or employee knowledge - at an eye-watering rate. The only alternative option open to them is to restrict data usage when employees are abroad, or demand they stick to wi-fi. Both of these "solutions" are far from ideal – and far from the promise of enterprise mobility. 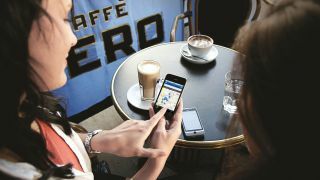 While the image of modern business might be the relaxed businessman sending a sales report while sipping a tiny espresso in a chic café, the reality is more like stumbling into an uncomfortable, harshly-lit fast food restaurant to grab some free wi-fi. If employees do have a roaming allowance, how do they know what too high a cost is? Data size limits are too opaque – how big is a typical email? Does sending a 4MB attachment account for 4MB of the allowance, or more? When is the end of the month and when does an employee's "data ration" start again? Even if allowances and data use can be tracked, planning the finances is more than tricky. We are frequently told that we are an important part of a wider global economy - that business cannot be parochial if the UK is to thrive. Businesses must have a global outlook and reach to be successful. But for this to be true, businesses need to be able to communicate freely without constantly checking the meter, or switching off altogether. Debates over data roaming are rumbling on in the EU parliament. But while these seemingly endless political efforts continue, UK business needs a multi-national mobile data solution now. Businesses need alternative wireless internet solutions that combat the current inadequacies in domestic and global mobile data provision and that provide predictable, low costs and reliable connection. This will mean far greater employee productivity while on the move – the original promise of enterprise mobility.